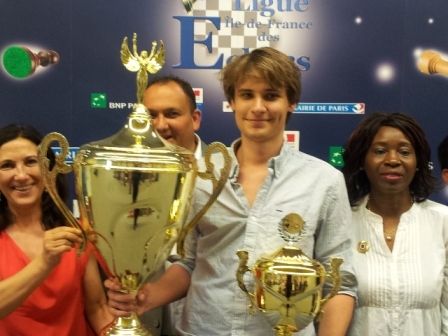 French International Master Adrien Demuth finished first at the 88th Championnat d’Echecs de Paris which took place on 6th – 14th July at the Stade Louis Lumiere, 30 rue Louis Lumière 75020 PARIS. Demuth got his first GM norm with his performance. The seven points he added in the nine rounds were enough to get sole first place and take home the winner’s trophy. The champion was lucky that the 5-hours game between Andrei Shchekachev and Jean-Pierre Le Roux finished in a draw. Filipino GM Joseph Sanchez finished second, while Shchekachev got the bronze medal thanks to their tiebreak scores.